Dr. William Hullfish, professor emeritus of music at The College at Brockport, is an accomplished musician and educator. He has an extensive performing career beginning with six years with The United States Air Force Band and Singing Sergeants. Dr. Hullfish participated in two State Department tours, one to South and Central America and the other to the Far East and Southeast Asia. He has also toured professionally with various music groups in every state in the United States, except Alaska, playing at the White House, the Kennedy Center, Constitution Hall, The Mormon Tabernacle, in Salt Lake City, and Carnegie Hall. Dr. Hullfish has toured Europe, playing concerts in Germany and Austria, including a concert of the music of Richard Wagner at Neuschwanstein Castle. In addition, he has played summers in every Canadian Exhibition from the Pacific Northwest Exhibition in Vancouver, British Columbia to the Calgary Stampede, Red River Exhibition, Toronto and Ottawa Exhibitions and the Montreal Music Festival. The founder and director of the nationally-recognized Golden Eagle String Band, Dr. Hullfish is an expert in American music, particularly Erie Canal songs. He was awarded a Gold Medal by the Smithsonian Institute as a Smithsonian/Folkways recording artist for his cultural contributions. He also has several publications and recordings, including "Horse-Ocean Sailor" and "Ireland's Grand Canal", both published by the American Canal Society. In addition to performing in the Brockport Symphony Orchestra, Dr. Hullfish performs in the Gateswingers Big Band, Temple Beth El Orchestra, Greece Community Orchestra, and the Greece Summer Symphony, among other ensembles. 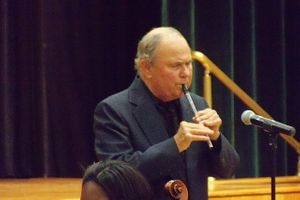 He is in great demand as a clinician and collaborative artist, with recent multimedia presentations and lectures at New York University, Middle Tennessee State University, University of Colorado Denver, and the Berklee College of Music, as well as a special concert appearance with the Albany Symphony, where he was a named a "national treasure" by music director David Alan Miller. Recently invited to Penn State for the third year as a featured artist-in-residence, he continues to perform, conduct, compose, and share his wealth of knowledge and experience with appreciative audiences across the country.